One of the senior captains on the Holmes High School football team asked the coaching staff if he could say a few words to his teammates after a weight training session last season. Stanley Niceley, a three-year starter at linebacker and offensive guard for the Bulldogs, unfolded a sheet of paper and read about growing up in a neighborhood where poverty and crime created an atmosphere of despair for young people. 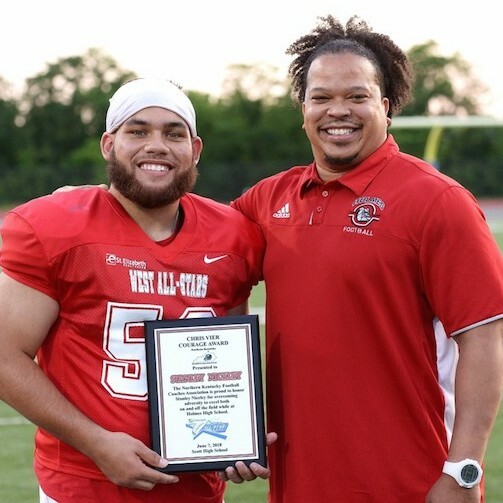 A few days ago, Niceley finished off his high school football career playing in the St. Elizabeth Healthcare East-West All-Star Game. At halftime, he received the Chris Vier Courage Award for overcoming those obstacles he faced to become an exceptional student-athlete. Niceley was on the straight “A” honor roll at Holmes and received the Most Outstanding Student Award in this year’s graduating class. He will attend the University of Louisville on an academic scholarship and plans to major in business management before applying to dental school. Holmes head football coach Ben Nevels was more than happy to present the Chris Vier Courage Award to Niceley, who was a team leader in every possible way. In junior high school, Niceley realized he was the one responsible for his future. He said his grandmother, Baretta Sue Niceley, provided the love and support he needed to avoid the negative influences all around him and take advantage of the opportunities provided through education. Holmes head coach Ben Nevels, right, presented the Chris Vier Courage Award to Stanley Niceley at halftime of the all-star game. (Photo by Dale Dawn). Unfortunately, his grandmother passed away right before he entered high school. That was a heartbreaking setback, but Niceley said he stayed on track with the support of other family members, teachers and friends at Holmes and members of his church. Football also played a role in developing his strong character. Holmes did not have a winning season during his varsity career, but his hard work and perseverance never wavered. Niceley was named to the conference all-star team twice and received the Mr. Holmes Bulldog Award. Last December, he was among the local players honored with a Top 26 Award by the Northern Kentucky Football Coaches Association. But the most memorable moment of his senior season may have been sharing his life story with his teammates to let them know anything is possible if you’re willing to work for it. After college and dental school, Niceley would like to return to Covington and set up a practice in his hometown.